A most unusual, really interesting Arkansas golden healer quartz plate from the type locality in Montgomery County. While much has been made of some uncleaned, iron-coated clusters from ancient mineral producing parts of Europe, which show no light and little color, THIS cluster, has iron oxide coated-sparkling drusy overcoated points with great translucency, as well as clear crystals over its' gleaming quartz and sandstone base. Missing crystals actually add to the play of light about this cluster, as well as proving occlusion [another mineral outside the crystal: not included]. 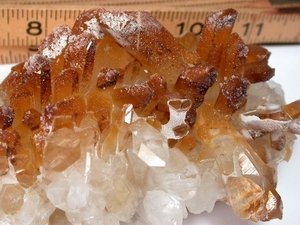 Several crystals are overgrown only partially, showing clear tips and insides. Of particular note are three areas of suspended drusy, the voids around them due to now eroded calcite or other natural supporting material. Neat large cabinet [4x 6x 2"high] from Collier Creek.